Our mission is to promote, support, and encourage clinical research. In keeping with Erlanger’s core mission and vision, Erlanger Institute for Clinical Research (EICR) seeks to provide excellent medical care and quality service to our patients while also striving to improve healthcare through clinical research—including clinical trials. 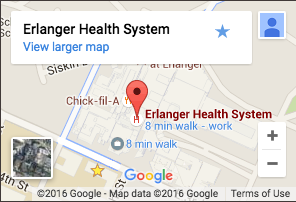 Erlanger seeks to unite two objectives which lie at the heart of every research endeavor: providing our patients access to innovative treatments, while simultaneously supporting our research associates as they conduct clinic trials that pioneer new standards in healthcare. EICR was created in 2013 to provide a platform of clinical research-related services for Erlanger-affiliated clinicians who take interest in research, or have the unique opportunity to address their patient’s needs with novel solutions and approaches, utilizing evolving new modalities and treatments through practical clinical research. EICR currently works with an ever-expanding variety of international, national, regional, and local clinical trial sponsors in efforts to undertake these novel, cutting-edge opportunities and establish more advancements within healthcare. Contact us or submit an inquiry to learn how to become a sponsor, investigator, or participant.